Arguably, the most eagerly anticipated show of the Spring/Summer 2019 menswear circuit had been Louis Vuitton; after all, countless pieces had been written dissecting the appointment of Virgil Abloh to the role of creative director back in March and musing about what the public could expect from the maison under his stewardship. It was to be an important moment for the designer, the brand and the industry as a whole. On Thursday, the curtain was finally raised on the opening act of Virgil’s Louis Vuitton. The result was star-studded, spectacular and streetwear-inflected... but not particularly surprising. Let us explain. When LVMH announced that Abloh would be taking over creative direction for the men’s collection, the company’s leadership emphasized that Vuitton was always meant to disrupt the luxury industry and serve the “nouveau riche”. The Spring/Summer 2019 collection and, more emphatically, the show, certainly drove that point home. The—very long—front row was a who’s who of buyers and editors, yes, but also of the creatives and artists that represent the millennial luxury customer that brands like Vuitton are desperately trying to capture: the new nouveau riche. But, wait, what about the actual clothes? Is all of this quote-unquote culture just meant to distract us from lazy designing? The answer to that question is a clear “no”. As mentioned above, it was easy to envision an Abloh-designed Vuitton collection unduly relying on the monogram and interlocked LV—particularly a debut collection in an era defined by graphics and logos. Virgil eschewed that. As the first 17 looks paraded down the runway it seemed that maybe Abloh was going to offer a strictly monochromatic white-on-white collection, which would challenge much of what we have come to expect from both him and Vuitton. The monogram on accessories was present, but simply embossed and metallic Louis Vuitton detailing was painted white, while everything from shirts to shearling jackets were displayed in... well, white. In a sense it all tied back to something that Abloh has talked about almost incessantly since taking the reins at Vuitton: the luxury T-shirt. The party favors were T-shirts and local design students were given tees as invitations, while Abloh told the Financial Times that the first thing he set down to work on at Louis Vuitton was making the perfect luxury T-shirt. And, much like the perfect luxury T-shirt, those first 17 white-on-white looks were definitely luxurious, without being glitzy; in a sense, those looks contradicted the brash aesthetic that Abloh has championed with Off-White and other projects. You could argue it even contradicts pieces Vuitton had adopted with print-heavy collections under Kim Jones. This debut collection also challenged the notion that Abloh wasn’t a particularly technical designer. With Vuitton’s resources and a talented team at his disposal, the designer sent monogrammed tactical vests down the runway, holsters, distorted quilted knits and even a furry chest pack. The tailoring, meanwhile, covered the spectrum from the billowing pants (which we’ve come to expect from Off-White, and to a lesser extent, recent Vuitton collections), to slimmer trousers and sharply cut two-button blazers. The collection also hosted baggy smoking jackets and even an asymmetrically-cut tuxedo jacket. But while the silhouettes were consistent across the collection, the color palette was not. At first glance, the second half of the show seemed inconsistent with the white-on-whites; the looks bounced around an eclectic color palette that—without the proper context (more on that in a second)—seemed drawn at random. This included purples, neon yellows, greens, orange and reds (oh the reds!). There were also the quasi-psychedelic all-over prints, the Wizard of Oz-inspired graphics and the “Follow the Yellow Brick Road” slapped on the back of the closing technicolor look. Upon closer inspection, though, it represented Abloh’s ability to put his finger on fashion’s collective pulse. The eclectic colors that punctuated the latter stages of the show and the prints that closed it are in tune with the rave-inspired mode that was on full display in Milan. Abloh explained to Sarah Mower of Vogue in a pre-show interview that his inspiration was light hitting a prism, hence the transition from white to a wide array of vibrant colors. So, in the end, it all makes sense. A lot of attention in the lead up to the show was paid to a trunk barren of Vuitton’s monogram and sneaker sketches—sneakers and the logo, that was what was supposed to define Virgil’s Vuitton. The sneakers didn’t disappoint and neither did his restrained use of the logo. In a way, we got what we were expecting, but in an unexpected way. Many of us were expecting modern luxury clothing, inflected with streetwear references and graphics. What we got, instead, was true modern luxury: a collection of garments that are not necessarily glitzy—despite the bright colors, few of the pieces ‘scream’ Vuitton—but are definitely luxurious, just like the perfect T-shirt that Abloh devoted so much time to in the lead up to his Louis Vuitton debut. As the show ended and Virgil shared an emotional moment with Kanye West, the importance of the T-shirt rang particularly true. This show was the culmination of a journey for Abloh and his friends. Virgil talked a lot about his friends in the build up to, and aftermath, of the show, because—ultimately—this was a shared experience for them too. From the flak received by Kanye West over his fashion aspirations, to the six years it took Virgil to go from the streetwear of Pyrex to the streets of Paris for Louis Vuitton, this show represents far more more than a literal runway show. 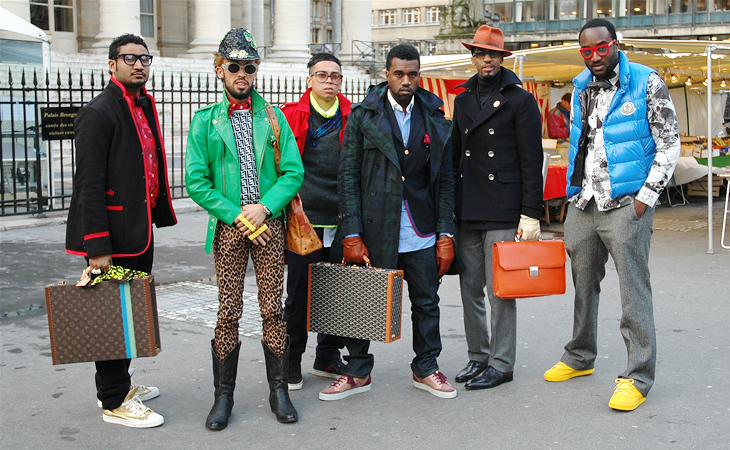 Thinking on the now-infamous group picture from Paris Fashion Week back in 2009, Abloh’s appointment is the latest—perhaps most powerful—stab against the regularity of the ‘high fashion and luxury’ paradigm; a guy who once was considered a caricature, mastered the art of streetwear and elevated it to the gardens of the Palais-Royale. Streetwear (and work inspired by it) is not separate from ‘fashion’ anymore—it is fashion. The designer went from screen printing T-shirts with friends to using the garment as a philosophical starting point for his first collection at Louis Vuitton. Maybe that’s what will come to define Virgil’s Vuitton: Like the work that’s helped bring Abloh to this new level, the use of streetwear can influence the maison’s philosophy—rather than define its actual runway garments.